The STS-120 crew members completed the day's scheduled inspections of Space Shuttle Discovery’s heat shield before noon EDT. They used Discovery’s robotic arm and an attached boom extension to check the spacecraft’s underside, nose cap and leading edges of the wings as well as hard to reach shuttle surfaces. 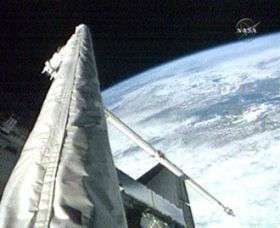 The inspections are performed to check if any damage occurred to the heat shield during the climb to orbit that began when Discovery lifted off Tuesday from Kennedy Space Center, Fla. Over the next few days, engineers and flight controllers will analyze the data collected by the STS-120 crew. Throughout the day, the crew has been preparing for Thursday’s arrival at the International Space Station. The day's activities include the extension of the shuttle’s docking ring and the check out of tools they will use to rendezvous and link up with the station. Docking is scheduled to occur at 8:33 a.m. Thursday. Earlier today, the STS-120 crew checked out spacesuits to be used during the mission’s five scheduled spacewalks at the space station. One of the major objectives of the spacewalks is the temporary installation of the station’s newest component, the Node 2 module, also known as Harmony. In addition, the crew will relocate the station’s P6 truss and solar arrays. STS-120 is also delivering a new crew member to the station.